Charlton's Head Coach - Iain Dowie - has confirmed that he has held talks with potential acquisitions, some of whom are currently in Germany playing in the World Cup. This can only be good news for Addicks fans, as little transfer activity has occurred since most of the forward line was released at the end of the season. We are still being linked with a number of potential targets (Sidwell (left), Mears, Edwards...), but interestingly Dowie said that some of the new players may be youngsters, bought for the future. The contract situation at English clubs means that any Bosman transfers are made official on 1st July and, as that is this Saturday, do not be surprised to see a couple of new signings announced then. Whether any make a significant impact on morale at the club, and with the fans, is dependent on who they are, but we remain hopeful. One long term target from Reading who is out of contract is James Harper, and he may well be announced as our first Bosman signing at the weekend. "According to the Associated Press, this is how Huang Jianxiang relayed the moment when Fabio Grosso went down under Lucas Neill's "challenge" in the last 10 seconds of the match to the millions of Chinese viewers on state-run CCTV. Penalty! Penalty! Penalty! Grosso's done it, Grosso's done it! The great Italian left back! He succeeded in the glorious traditions of Italy! Facchetti, Cabrini and Maldini, their souls are infused in him at this moment! 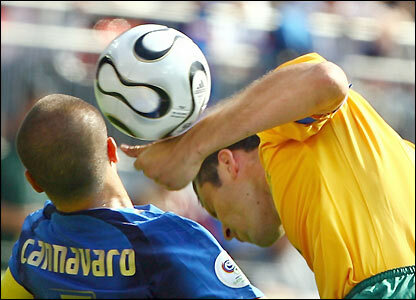 Grosso represents the long history and traditions of Italian soccer, he's not fighting alone at this moment! He's not alone! More was to come when Francesco Totti converted the spot-kick. Goooooal! Game over! Italy win! 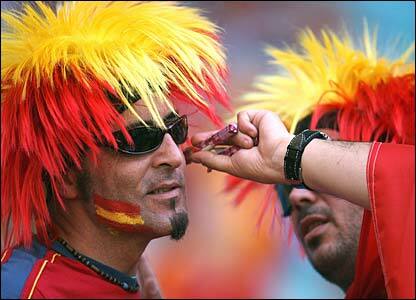 Beat the Australians! They do not fall in front of Hiddink again! Italy the great! Left back the great! Happy birthday to Maldini! Forza Italia! The victory belongs to Italy, to Grosso, to Cannavaro, to Zambrotta, to Buffon, to Maldini, to everyone who loves Italian soccer! Hiddink ... lost all his courage faced with Italian history and traditions ... He finally reaped fruits which he had sown! They should go home. They don't need to go as far away as Australia as most of them are living in Europe. Farewell! Huang later said he couldn't remember what he had said in the heat of the moment and his preference for Italy was because he had commentated on Serie A for many years. "I'm more familiar with Italian players ... and I don't like Australians indeed. I was hoping they'd do badly." This followed the whingeing that Radio Five Live broadcast of Aussie's who attended the game - unfair, cheated, unlucky, undeserving, were all trotted out as excuses. The facts are that they couldn't beat ten men, so stop all the moaning! That's the trouble with Kingsley Adams airport in Sydney, even when the planes turn their engines off, the whining continues! You've lost the Ashes, you're out of the World Cup, and even the Irish beat you at Aussie Rules! Now that's what I call setting myself up for a fall come Saturday evening!!! England have made it to the quarter finals of the World Cup, but their play is far from entertaining or fluent. The game against Ecuador, which on paper was one of the easier last 16 matches for a seeded team, failed to raise the spirits of the populace at home and, realistically, on this showing, Portugal look like they might be far too strong for Sven's team next weekend. Sven's team formation looked all wrong again for me. If Carragher was at fault for a Swedish goal, then he paid the price, but is Hargreaves really a better right back option? I don't think so. His passing is OK, but positionally he is suspect, and he is nowhere near the defender that Carragher is. Maybe Gary Neville will be fit this weekend, and any arguments rested if the Manc can return to right back. The midfield vacancy created by moving Hargreaves back led to a first competitive game for Michael Carrick. The Geordie seemed to be the culprit of the swearing in the tunnel beforehand (unless it was another Northerner from the bench?) which meant he was up for it, but I thought the midfield was just too congested and Lampard and Gerrard crowded the centre circle area preventing Carrick from spreading play. The second half was better, when Gerrard moved wider, but still pretty poor. Beckham went sick - all the excitement of getting a free kick past the wall? Maybe! Why wasn't he substituted when he was ill though, and allowed to stay on the pitch for twenty minutes doing nothing? Lennon looked good when he came on, adding pace and skill to a static team. Even the crowd in the stadium went very quiet for the first time this World Cup - whether the Germans who went got bored or the English just deflated was hard to tell, as it wasn't a pretty match to watch. Back home, plenty of shirts and flags on show out on the streets beforehand, and 4pm kick offs certainly get the young Brits drunk by early evening...A shame that the dullness of the match makes some want our oppo to win! The expectations of the country are still high, though lower than they were. If Big Phil succeeds in a hat-trick of knocking England out of major tournaments, then I think some poeple will be quite happy that the debacle and trauma are quelled. The media seem ready to crush the team when they return beaten - swords being sharpened as we speak - and Sven will bear the brunt of the attacks. But if we can win again - though how I don't know - the press will no doubt build the semi-final up into a massive, massive match, and laud the boys up to incredible levels from whence the only way is down. I wan the team to win; not just for England, Harry, and St George, but to stuff the media and prevent them from trashing our best players. I had a long drive this weekend along the A12 in both directions; the section between the M25 and Ipswich is dual carriageway all the way and most of the traffic travels pretty fast. I noticed something on the way up there, and had it confirmed big time on the way back - the central reservation is littered with red and white flags - the cross of St George - that had been blown off cars/vans and come to rest in the middle of the two carriageways. I counted eleven in just one short stretch of about half a mile coming back today. There were hundreds I reckon along the whole 40-odd mile stretch I drove. Imagine the screaming kids yelling at dad that the flag had just flown away as they belted along the main cross-county road of Essex! Can we stop, go back and get it; we will have to buy another one, ha ha! Sales must be twofold at least in the service stations along the A12 (and probably other fast roads too!). Another funny thing I've noticed with the World Cup is some of the players names. Football fans get used to most of the players names, especially in this country, and with participants in the Champions League and UEFA Cup, so Fred, the Brazillian forward who scored today, is one name that is funny but slightly familiar. My favourite surname so far though is the Ghanain substitute (in both of their games so far) Razak Pimpong (left) - cracks me up when I hear that in commmentary! What do I know about football? Not a lot, according to the current World Cup Fantasy League run by the Metro newspaper. I currently sit at the bottom of my work league, and have over 200,000 other Metro readers in front of me in terms of points from the first round of World Cup games - even my girlfriend is beating me!!! Top of our league is the Chelsea supporter - he was lucky enough to be able to buy 11 Chelsea players with his £100,000,000 (and Kaka was his other choice! ), something that Roman is hard pushed to do these days. I obviously tried to do the same with Charlton players, but Cory Gibbs got injured and I had to dump him before the games started. I looked for a number of other Charlton stars, but for some reason Darren Bent wasn't available? What a poor decision that was in hindsight eh? Hopefully the number of transfers and substitutions I've made tonight will push me up the league table before the week is out, but I doubt I can win from here - a bit like Ukraine! The World Cup kicked off yesterday, and the first thing that strikes me from the opening two games is that the American teams (North, Central, and South) will be no push-overs. Costa Rica gave the host nation Germany a fright, equalising in the first half, and then scoring again to set up an interesting last twenty minutes. Paulo Wanchope (left), the ex-Derby, West Ham and Manchester City striker, scored both Costa Rican goals, and he became the first 2006 World Cup player to be linked with Charlton immediately after the match. He will not be the last! England, and the English fans, will do well to remember that Paraguay, whom England play later today, are a stronger team than both Costa Roca and Ecuador, so the result is not a foregone conclusion. Hopefully, the warning wil have been heeded by Sven and his men, and an English victory secured without injury or too much to worry about. Plenty has happened in the first week of Iain Dowie being head coach at Charlton - players have left, the potential UEFA Cup spot was lost, and even the Elton John gig went off without hitch. Since the furora of the Dowie appointment, the news surrounding the writ issued by Simon Jordan has died down. This is probably due to Charlton, and Richard Murray, putting the full weight of their team of lawyers onto the case. Murray is insistent that Charlton played by the rules - that Dowie was unattached when approached. Whether this goes to court, or if Jordan does what Murray says he should (i.e. pick up the phone and talk to him, man to man, rather than conducting business through the media) is open for conjecture. It wouldn't surprise me in the least to see Charlton settle out of court, with maybe £500,000 heading across London. Mind you, if Murray wants to play hard, the only money changing hands would be toward the pockets of the legal profession. Luke Young is one player who certainly hasn't been inpressed by Dowie's arrival. Our right back decided to rattle the cage, again through the press, rather than face up and talk like a man. I can't say I've ever been a fan of Lukey; in his first few seasons at The Valley, he always semed to get injured on the morning of a big game - if Thierry Henry was coming, then Luke used to catch a cold, forcing him out of the limelight. Next week, he'd be back right as rain, unless Ryan Giggs was in the opposition! Recently, Luke has faced up to his responsibility as Captain, and played every match. Now he thinks he can go and join another club, simply because he only has a year left on his contract and Charlton were concentrating on finding a manager rather than talking terms with him. Nearly every player at Charlton knows the score - the club does all its talking at the end of each season, not via the papers, and not after so-and-so has had the odd good game. Luke - if you want a transfer, forego your ten per cent of the transfer fee and ask for one; if not, sit round the table and start discussing the very lucrative offer that Charlton have put in front of you! 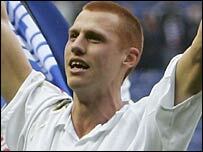 Chris Perry has left the club after three years service - I think he played 58 games in total during that time. "The Rash", as he was known during his Wimbledon days, was a good player, but he was prone to the odd fatal mistake - I remember his poor back header against Manchester City which led to the fourth (or was it the fifth?) goal at The Valley on a truly awful day early last season. I also remember his good games too, and especially vivid was the Liveropool home game when he decided that Peter Crouch was too tall to compete with when trying to chest a ball so he went under his arms, several times, in order to win the ball! Brilliant! Crouch had a nightmare match and was substituted, and all because of a player 11 inches shorter than him! Perry looks like he may be joining Reading, and if so, he will give them plenty of experience in their first Premeiership foray. Also out of the door goes Jay Bothroyd. The ex-Gunner never really set the Valley alight, although he was second top scorer after Darren Bent. Free kicks whacked into the back of the covered end net apart, Jay just didn't do enough when the ball was in play. He will probably play for a reasonable Championship team, and score a few, but he just isn't Premiership class. Jonathan Fortune has been handed a new three year contract which is well deserved. Jon has a few admirers and he does add steel to the back line when playing. This season he had a number of minor injuries which kept him sidelined for long spells, but he always tries his best when in the team. Some fans have queried why Fortune got a contract but Perry did not - age, height, and wage packet size are all probably factors in the decisions. The Elton John gig went off OK I've heard - a friend got a late spare ticket and had a fun evening out with 21,000 others. I just hope that Paddy is OK with what's left of the pitch - we don't want Dowie to use it as an excuse not to play the ball along the ground! It was good to see Jason Euell back playing to some sort of decent level for Jamaica - he scored against Ghana, and brought a very good save out of Englnad goalie Paul Robinson in the two recent games. He may be interested in staying at The Valley now that Curbs has gone, so dangling a new contract might not be bad timing...? So now most of the countries attention will switch to Germany, and the World Cup. Will Rooney be fit? Will Michael Owen last a game? Will Theo Walcott become the youngest England goalscorer ever? Probably yes to all three... I would love England to win the Cup but I'm afraid I just can't see it - mind you, I don't think Germany, Italy, Spain, or France will win either. Nope, the Pedro45 money bet is on the Czech Republic, as long as they get through the first round (which isn't certain from the group of death!). It's going to be a media frenzy; the World will almost stop when games are played, and this country is no exception. 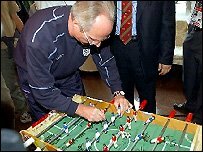 If Sven pulls it off, he wil be lauded for many a year, but watch him creep away if and when England do get beat. Enjoy the fun! Blogger 2005 - 2011; ex-Shareholder since 2010. Enter your email address below to subscribe to Charlton Athletic Online!